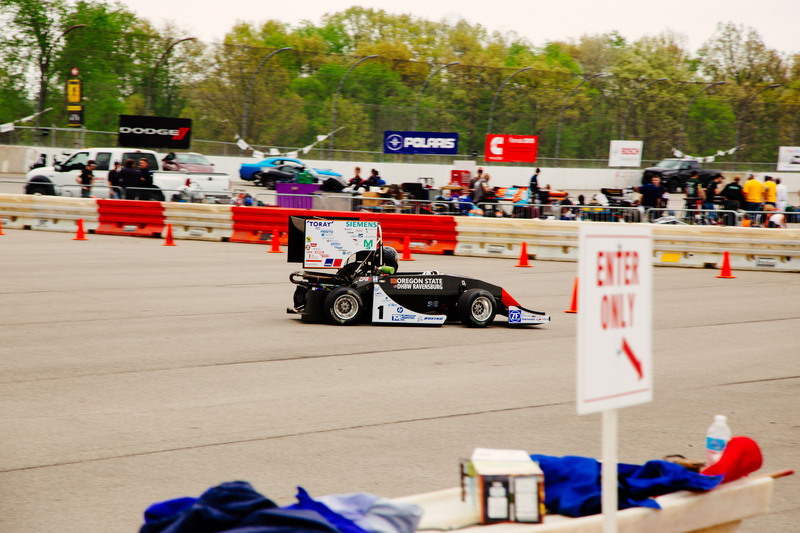 From the 13th to 16th of May our combustion car, the GFR15c, participated in its first competition of this season taking place at Michigan International Speedway in Brooklyn. MI. In 2015, there have been more changes to the car than ever before, making the first competition even more thrilling. The outer appearance of the car has changed significantly due to the new monocoque design. Moreover, major rule changes required a complete rework of the aerodynamics package. Starting from Oregon early in the morning on Monday the 11th, the team travelled 3800 km with two vans and a truck carrying everything from pit supplies, camping gear and the new formula car. After a 40 hour road trip through nine states, the team finally arrived on Tuesday night and met up with a few German team members who flew across the Atlantic for this one competition. After setting up camp, the team took the truck to the paddock and began preparing for dynamic and static events. GFR15c had a strong performance in the dynamic events. 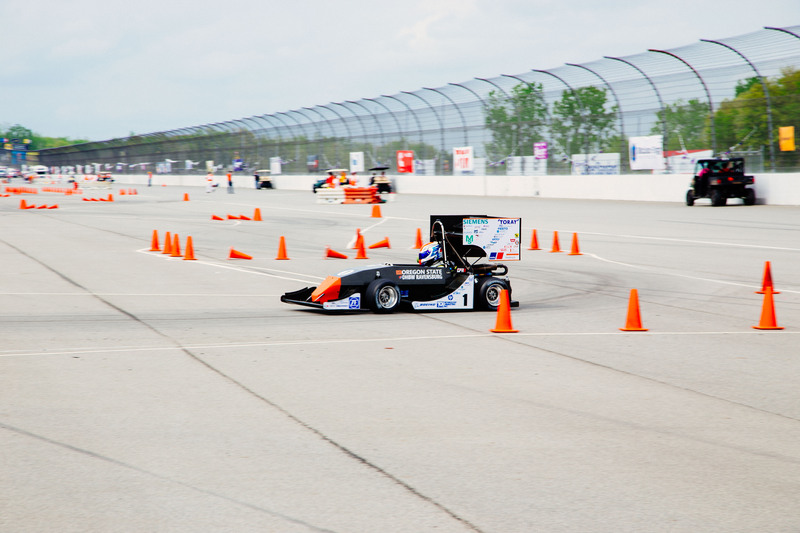 In autocross both drivers completed the event scoring the fastest laps times by over one second to the next car. During the all important endurance event the great performance continued, and the car finished first place. Even more impressively, the team won the title for ‘fuel efficiency’. Even with the great dynamic results for GFR, our closest competitors were our friends from ‘TU Graz’. 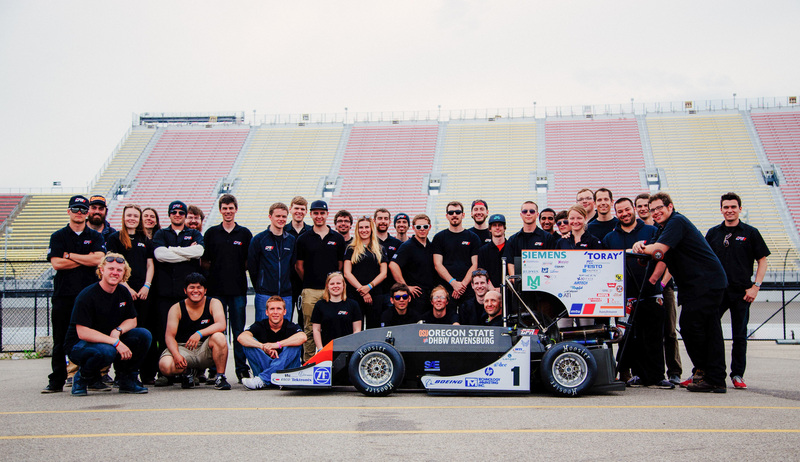 They were one of two European teams at Michigan that competed with their 2014 car with a modified aerodynamic package to meet the updated rule requirements. Due to the major rule changes for the aerodynamic packages many European teams could not attend this competition, as traditionally they present their cars from the previous season. TU Graz posted slightly faster skidpad and acceleration times and were solid in all statics Events. As the event ended GFR placed a very close second place behind the ‘TU Graz’. Due to late point deductions for the ‘TU Graz’ after the event the overall ranking changed in favor of the GFR. Finally, we won the FSAE Michigan, with the ‘University of Florida’ placing second and the ‘TU Graz’ finishing third. We are really proud of our performance during this competition despite all the major changes that were made to car. The entire team is excited to compete on the ‘Hockenheim – Ring’ in Germany and on the ‘Red Bull – Ring’ in Spielberg, Austria where both combustion and electric car will be participating. We expect to continue our high performance and look to improve our results even further.